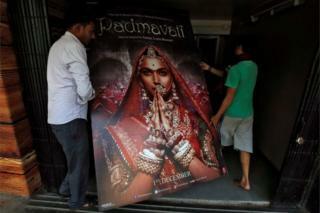 India's Supreme Court has cleared the release of controversial Bollywood film Padmavat, and overturned the decision by four states to ban its screening. It has been approved by the Central Board of Film Certification (CBFC), but Gujarat, Rajasthan, Madhya Pradesh and Haryana imposed a ban. It is set to be released on 25 January. "Cinemas are an inseparable part of right to free speech and expression," said Chief Justice Dipak Misra. "States... cannot issue notifications prohibiting the screening of a film," he added. The producers had approached the Supreme Court to challenge the states' ban. The court had already rejected an appeal by a lawyer to block the film's global release. In December, the Central Board of Film Certification (CBFC) told local media it had not asked for any cuts. But it recommended changing the film's name from Padmavati to Padmavat, after the 16th century epic poem of the same name. The film tells the story of a 14th Century Hindu queen belonging to the high Rajput caste and the Muslim ruler Alauddin Khilji. Bollywood stars Deepika Padukone and Ranveer Singh play the lead roles. Hindu groups and a Rajput caste organisation allege that the movie, directed by Sanjay Leela Bhansali, depicts an intimate romantic scene between the two characters; the producers of the film deny this. Protests have seen Rajput community members have burned effigies and threats have been aimed at the actors. Although a fictional character, the Hindu queen Padmavati is deified and held as a symbol of female honour among Rajputs. Rumours about a scene in the film of the Muslim king dreaming of a romantic tryst with the Hindu queen enraged many, including the Rajput Karnik Sena, a fringe caste group that called for the film to be banned. The controversy comes amid an upsurge of Hindu nationalism since Prime Minister Narendra Modi came to office in 2014. Muslims and members of the Dalit caste have been murdered in "beef-lynchings", the iconic Taj Mahal has been attacked over its Muslim heritage and there have been efforts to undermine Mahatma Gandhi's standing over his dream of Hindu-Muslim unity.